From the outset, Russiagate proponents have exhibited a blind faith in the unverified claims of US government officials and other sources, most of them unnamed. The reaction to special counsel Robert Mueller’s recent indictment of 12 Russian military-intelligence officers for hacking of Democratic party servers and voter databases is no exception. Mueller’s indictment is certainly detailed. Most significantly, it marks the first time anyone has been charged for offenses related to Russiagate’s underlying crime. But while it is a major step forward in the investigation, we have yet to see the basis for the allegations that Mueller has lodged. As with any criminal case, from a petty offense to a cybercrime charge against a foreign government, a verdict cannot be formed in the absence of this evidence. The record of US intelligence, replete with lies and errors, underscores the need for caution. Mueller was a player in one of this century’s most disastrous follies when, in congressional testimony, he endorsed claims about Iraqi WMDs and warned that Saddam Hussein “may supply” chemical and biological material to “terrorists.” That does not mean Mueller perjured himself back then, or that he is concocting a false case now. It just means that government officials can make mistakes based on faulty information. Suppose, however, that all of the claims about Russian meddling turn out to be true. Hacking e-mails and voter databases is certainly a crime, and seeking to influence another country’s election can never be justified. But the procession of elite voices falling over themselves to declare that stealing e-mails and running juvenile social-media ads amount to an “attack,” even an “act of war,” are escalating a panic when a sober assessment is what is most needed. Pundits and politicians have even compared Russiagate to Pearl Harbor, 9/11, and Kristallnacht, accompanied by bellicose calls for revenge. According to Democratic Representative Steve Cohen of Tennessee, a sufficient response would be “a cyber attack that made Russian society valueless.… If they all fell underneath the Kremlin and buried together, it’d be too soon” [sic]. Perhaps just as troubling is the degree of imperial myopia that Russiagate’s complainants unwittingly lay bare. Richard Haass, the head of the Council on Foreign Relations, solemnly intoned that Russia, through its annexation of Crimea and meddling in the 2016 election, has broken the “international order for 4 centuries” that had been “based on non-interference in the internal affairs of others and respect for sovereignty” and thus should be dealt with “as the rogue state it is.” It takes more than mere historical amnesia to make such pronouncements in the face of the United States’ leading role throughout the preceding centuries in meddling in and attacking foreign countries—as did the George W. Bush administration that Haass served in. It also requires the entitlement and hypocrisy of a US exceptionalism that insists on holding others to standards that we strenuously reject for ourselves. Fixation on the alleged Russian threat does not just obscure our own past. With the attendant suspicion of Trump’s potential subordination to Putin, it is obscuring the reality in front of us. Anyone paying attention to Trump’s actual policies cannot escape the conclusion that his administration “has been much tougher on Russia than any in the post-Cold War era” (Daniel Vajdich of the NATO-funded Atlantic Council), wherein “U.S. policy toward Russia has, if anything, hardened under [Trump’s] watch” (Brookings fellow and former State Department official Jeremy Shapiro). The new Pentagon budget earmarks $6.5 billion for the European Deterrence Initiative—a military program aimed at confronting Russia in Eastern Europe—a 91 percent increase over President Obama’s last year in office. Following Trump’s decision to sell anti-tank missiles to Ukraine—a move Obama resisted—the Pentagon has just announced $200 million in new military assistance. The NATO summit right before Helsinki prompted widespread suspicions that Trump was undermining the transatlantic alliance, possibly at Putin’s behest. All seemed to overlook what Trump actually did: openly criticize Russia’s prized Nord Stream 2 gas project with Germany and badger NATO members to increase military spending. At a post-Helsinki Senate hearing, Secretary of State Mike Pompeo touted Trump’s “massive defense buildup that threatens Vladimir Putin’s regime” and reaffirmed that the United States will never recognize the Russian annexation of Crimea. This consistent record of Trump directly contradicting Putin’s agenda is inconvenient to a collusion-and-kompromat hypothesis, so it is little wonder that it is overlooked. Instead of focusing on policy, the press has engaged in commentary more appropriate for an ice-skating performance. Blake Hounshell of Politico questions why Trump is “oddly submissive” with “the diminutive Putin,” with the American president “slumping in his chair” next to the Russian leader. 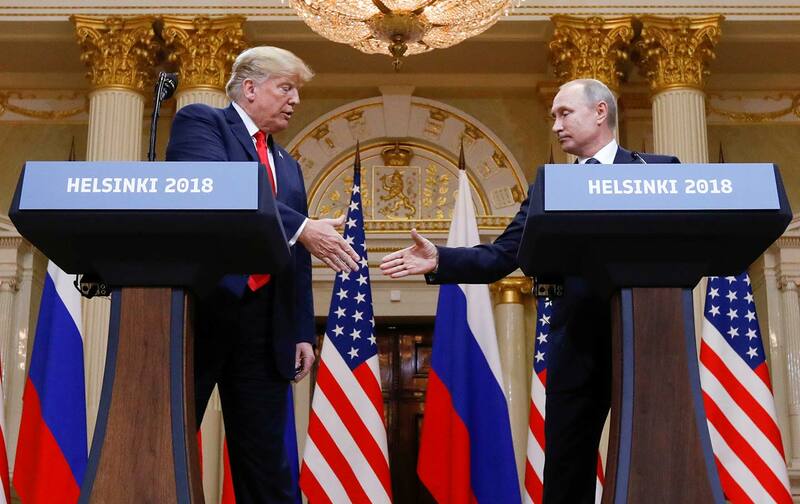 “The way Trump behaves around Putin—quietly bowing and scraping, taking his word over America’s own chief of intelligence,” writes The Week’s Ryan Cooper, “is simply wildly out of character.” Except that it’s not. Trump has been deferential to many authoritarian leaders—hardly out of character, by the way, for any American president. And if Benjamin Netanyahu is to be believed, Trump even let the Israeli prime minister convince him to nix the Iran nuclear deal. Amid fervent speculation that Trump may be a Kremlin asset, Israel’s brazen (and actually documented) foreign meddling barely registers, joining an innumerable number of critical issues that the Russiagate frenzy has sidelined. It has gotten so extreme that even Trump’s new threats of war on Iran, coupled with an escalating administration campaign to destabilize its government, has been ignored or even downplayed as an effort to distract us from his Russia woes. But in the absence of publicly available evidence, and an outburst of both panic and chauvinist warmongering, it is arguably we who are distracting ourselves. Under one of the most dangerous administrations in US history, that willful and heedless diversion may be the far most serious national-security crisis we face.